The science underlying Energy Vault’s technology is simple. 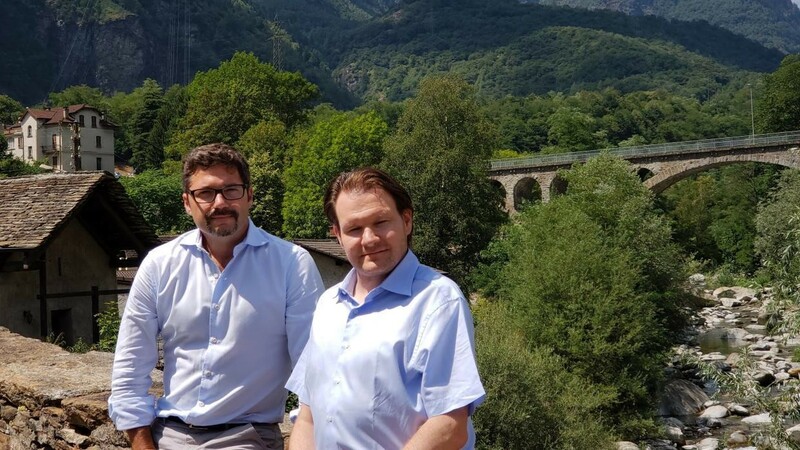 On a hot July morning, I traveled to Biasca, Switzerland, about two hours north of Milan, Italy, where Energy Vault has built a demonstration plant, about a tenth the size of a full-scale operation. The whole thing—from idea to a functional unit—took about nine months and less than $2 million to accomplish. If this sort of low-tech, low-cost innovation could help solve even just a few parts of the huge energy-storage problem, maybe the energy transition the world needs won’t be so hard after all. The science underlying Energy Vault’s technology is simple. When you lift something against gravity, you store energy in it. When you later let it fall, you can retrieve that energy. Because concrete is a lot denser than water, lifting a block of concrete requires—and can, therefore, store—a lot more energy than an equal-sized tank of water. Once the crane arm locates and hooks onto a concrete block, a motor starts, powered by the excess electricity on the grid, and lifts the block off the ground. Wind could cause the block to move like a pendulum, but the crane’s trolley is programmed to counter the movement. As a result, it can smoothly lift the block, and then place it on top of another stack of blocks—higher up off the ground. When the grid is running low, the motors spring back into action—except now, instead of consuming electricity, the motor is driven in reverse by the gravitational energy, and thus generates electricity. The innovation in Energy Vault’s plant is not the hardware. Cranes and motors have been around for decades, and companies like ABB and Siemens have optimized them for maximum efficiency. The round-trip efficiency of the system, which is the amount of energy recovered for every unit of energy used to lift the blocks, is about 85%—comparable to lithium-ion batteries which offer up to 90%. Energy Vault keeps costs low because it uses off-the-shelf commercial hardware. 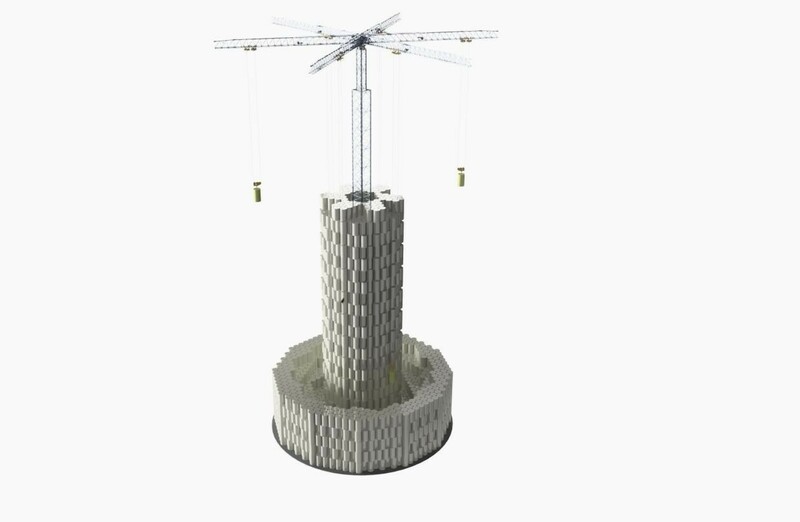 Surprisingly, concrete blocks could prove to be the most expensive part of the energy tower. Concrete is much cheaper than, say, a lithium-ion battery, but Energy Vault would need a lot of concrete to build hundreds of 35-metric-ton blocks. So Pedretti found another solution. He’s developed a machine that can mix substances that cities often pay to get rid off, such as gravel or building waste, along with cement to create low-cost concrete blocks. The cost saving comes from having to use only a sixth of the amount of cement that would otherwise have been needed if the concrete were used for building construction. The demonstration plant I saw in Biasca is much smaller than the planned commercial version. It has a 20-meter-tall, single-armed crane that lifts blocks weighing 500 kg each. But it does almost all the things its full-scale cousin, which the company is actively looking to sell right now, would do. Robert Piconi has spent this summer visiting countries in Africa and Asia. The CEO of Energy Vault is excited to find customers for its plants in those parts of the world. The startup also has a sales team in the US and it now has orders to build its first commercial units in early 2019. The company won’t share details of those orders, but the unique characteristics of its energy-storage solution mean we can make a fairly educated guess at what the projects will look like. Energy-storage experts broadly categorize energy-storage into three groups, distinguished by the amount of energy storage needed and the cost of storing that energy. First, expensive technologies, such as lithium-ion batteries, can be used to store a few hours worth of energy—in the range of tens or hundreds of MWh. These could be charged during the day, using solar panels for example, and then discharged when the sun isn’t around. But lithium-ion batteries for the electric grid currently cost between $280 and $350 per kWh. Cheaper technologies, such as flow batteries (which use high-energy liquid chemicals to hold energy) can be used to store weeks worth of energy—in the range of hundreds or thousands of MWh. This second category of energy storage could then be used, for instance, when there’s a lull in wind supply for a week or two. The third category doesn’t exist yet. In theory, yet-to-be-invented, extra-cheap technologies could store months worth of energy—in the range of tens or hundreds of thousands of MWh—which would be used to deal with interseasonal demands. For example, Mumbai hits peak consumption in the summer when air conditioners are on full blast, whereas London peaks in winters because of household heating. Ideally, energy captured in one season could be stored for months during low-use seasons, and then deployed later in the high-use seasons. Piconi estimates that by the time Energy Vault builds its 10th or so 35-MWh plant, it can bring costs down to about $150 per kWh. That means it can’t fill the needs of the third category of energy-storage use; to do that, costs would have to be closer to $10 per kWh. In theory, at the current capacity and price point, it could compete in the second category—if it could find a customer that wanted Energy Vault to build dozens of plants for a single grid. Realistically, Energy Vault’s best bet is to compete in the first category. That said, some experts told Quartz that the cost of lithium-ion batteries, the current dominant battery technology, could fall to about $100 per kWh, which would make them cheaper even than Energy Vault when it comes to storing days or weeks worth of energy. And because batteries are compact, they can be transported vast distances. Most of the lithium-ion batteries in smartphones used all over the world, for example, are made in East Asia. Energy Vault’s concrete blocks will have to be built on-site, and each 35 MWh system would need a circular piece of land about 100 meters (300 feet) in diameter. Batteries need a fraction of that space to store the same amount of energy. Batteries do have some limitations. The maximum life of lithium-ion batteries, for example, is 20 or so years. They also lose their capacity to store energy over time. And there aren’t yet reliable ways to recycle lithium-ion batteries. Energy Vault’s plant can operate for 30 years with little maintenance and almost no fade in capacity. Its concrete blocks also use waste materials. So Piconi is confident that there’s still a niche that Energy Vault can fill: Places that have abundant access to land and building material, combined with the desire to have storage technologies that last for decades without fading in capacity. Meanwhile, whether or not Energy Vault succeeds, it does make a strong case for the argument that, while everyone else is out looking for high-tech, futuristic battery innovation, there may be real value in thinking about how to apply low-tech solutions to 21st-century problems. Energy Vault built a functional test plant in just nine months, spending relative pennies. It’s a signal of sorts that some of the answers to our energy-storage problems may still be sitting hidden in plain sight.